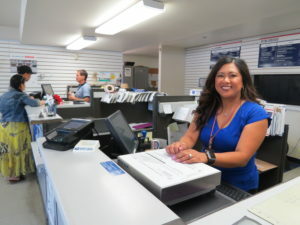 Photo by Marty Cheek * Charlotte Hernandez is the new postmaster at the San Martin Post Office. 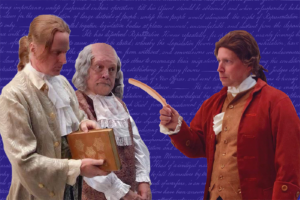 Unless there’s a member of Congress as a resident, the position of postmaster is usually the highest-ranking federal official in a town or city. Charlotte Hernandez now fits that role for San Martin, managing 10 employees who sort and distribute the U.S. mail six days a week at the rust-colored building at 200 East San Martin Avenue. 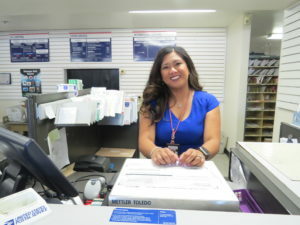 The 40-year-old postal employee transferred from the Gilroy Post Office last October and started working at the San Martin branch serving the rural community’s 7,000 residents. Working with customers at the front counter, Hernandez quickly saw the vital role the branch plays in ensuring the South Valley community stays connected to the rest of the world. She officially stepped in the role of San Martin postmaster June 23. Running the branch is managing a community business, Hernandez said. The branch’s employees have a lot of regular customers whom they know by name as well as their kids and grandkids, she said. The workers love getting to know San Martin’s residents in that personal way. Prior to joining the postal service, Hernandez worked for 11 years at the Salinas and San Jose Red Lobster restaurants as a server and bartender. 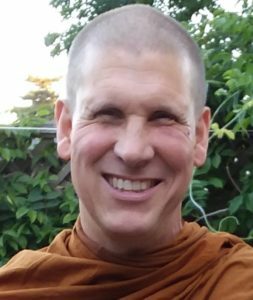 She had a son and when he was less than a year old, her father suggested she get a new job with the U.S. Postal Service. The job’s early morning hours would give her more time later in the day to take care of the boy. Photo by Marty Cheek * Charlotte Hernandez in the back sorting area of the San Martin Post Office. 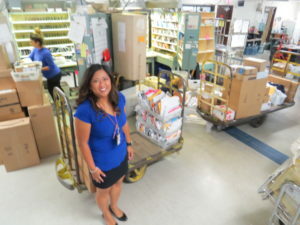 She applied for a postal position and in 2000 started a new career at the Gilroy branch. During the 17 years she was there, she worked hard and rose in the ranks to become a supervisor. The daily camaraderie forms a bond of postal workers committed to making sure the mail gets delivered to the right addresses, she said. She sees the same spirit of dedication to their jobs. 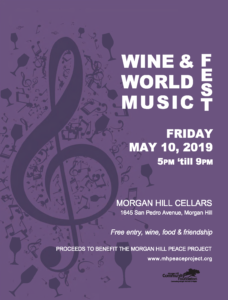 And because of its smaller size compared to Morgan Hill and Gilroy, she knows many of the residents who come into the post office on a regular basis. The friendly attitude of the community makes it a joy to come to work, she said. “I consider San Martin a small town with a big heart,” she said. Born in Fort Ord when her father was a supply sergeant with the U.S. Army, Hernandez’s formative years were spent exploring America and Europe as her family traveled to different military bases. They moved twice to Nuremburg, Germany, as well as Washington state and Fort Bragg, North Carolina, where she graduated from high school. She considers herself a “California kid” and came back to the Golden State to make a home here. After marrying Christian Hernandez, the couple started raising five children— Christian, Jr., Anthony, Julian, Diego and Natalia. The U.S. Postal Service provides much value to small communities like San Martin in shaping the local economy and society, Hernandez said. When Hernandez gave tours to elementary students at the Gilroy Post Office, many children were amazed at the process of delivering the mail. She would show them machines that would laser scan a letter or package to help the carrier sort it for the right destination. The mail piece is then put on a truck and taken to a massive postal facility in San Jose where it’s sorted for the carrier route it needs to go into. The mail piece gets sorted by what airline it needs to go to if it’s out of the region. Young people who are experts at texting often find “snail mail” a quaint system of communication delivery, Hernandez said with a laugh. San Martin Post Office employee James Myrick first met Hernandez when she started at the Gilroy branch. Hernandez keeps a positive spirit in the daily adventure of delivering mail, said Allison Shelton, a clerk at the San Martin Post Office. Hernandez is a postmaster dedicated to the best-quality of life for the San Martin community, Shelton added. 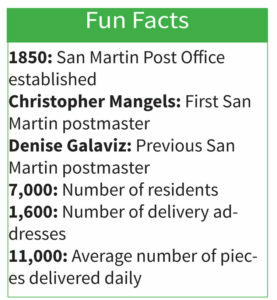 For Hernandez, serving her San Martin customers as postmaster is more than a job, it’s a commitment to building a community.